Abhyanga is an ancient East Indian massage style employed for thousands of years to ground the restless energies of the body and mind. The deeply relaxing, centering effect makes this type of massage a good choice for people experiencing insomnia, anxiety, travel lag, frazzled nerves or scattered energy. Scattered, fragmented or depleted energy over time can lead to lack of presence and comfort within our own beings. This is classified as an air element imbalance or “Vata” imbalance, according to Ayurveda. Ayurveda is the ancient science of India. It is the science of beauty and the study of life. Abhyanga massage is described in the ancient Ayurvedic texts. It aims to balance the air element of the body by creating warmth, connection, comfort, and deep relaxation. Abhyanga massage allows for release of amma (sticky toxins), release of negativity, and release of excess nervous energy, bringing one back to a balanced and grounded state. People are usually quite clear-headed after receiving this type of massage. It is profoundly healing, and one of the massage styles that I personally love the most. The method is simple. Abhyanga uses warmed sesame oil and rapid rhythmic strokes to coax and lull the body into a deep state of letting go. The warm oil is soothing for cracking joints and dry skin, making it a great fall or winter massage. The rapid back and forth strokes get the entire body rocking and rolling, inducing a pacified state for both the nervous system and emotional body. The heat and friction boost circulation more than other types of massage, creating a powerful detoxifying effect for the skin, muscles, and joints. The long rapid back and forth strokes are made along your spine, arms, and legs, providing very thorough and complete coverage. The short rapid back and forth circular strokes around the shoulder girdle, hips, sacrum, knees, and elbows releases pent-up energy in the joints beautifully, returning them to a state of energy and flexibility. This massage is deeply satisfying for both the giver and the receiver. 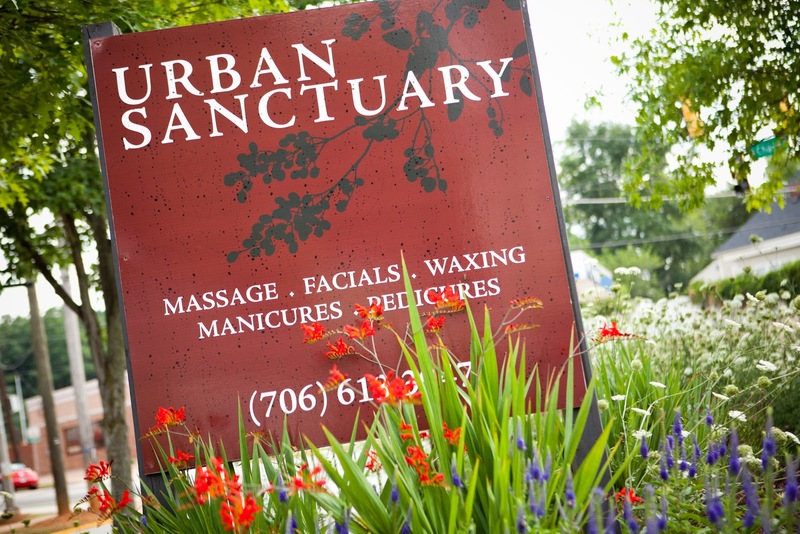 At Urban Sanctuary, we use a Vata balancing herbal infused oil with lemon, geranium, and cardamom. The effect is marvelously grounding. People have experienced, as a result of Abhyanga massages, improved sleep, expanded capacity to breath deeply. relief from aching knees, increased energy, and complete revitalization. Once you have received an Abhyanga massage from a professional, it is easy to develop a practice of doing some self-massage at home or at the gym utilizing this technique. I like to use slightly warmed sesame oil to massage my ankles, knees, legs, low back, and hips in the winter-time before going for a long walk or run outside. It is easy to do in the bathroom or kitchen without making an oily mess. I have several friends and clients who enjoy a habit of self-massage before exercise or long car trips. Another occasion to employ self-Abhyanga massage is during times of insomnia or high anxiety. A little bit of warm oil applied in rapid heat-producing strokes to the chest, hips, legs or feet has a very grounding, centering and comforting effect. This can induce sleep or calm when needed. A ten or twenty-minute routine used one to three times per week creates amazing flexibility, increased energy, and decreased clumsiness and injury. Self-massage is often recommended as an important part of personal health care in both modern and ancient East Indian health texts. At spas, where Abhyanga is available, it usually costs $10 or so more than other massages on the menu, due to the additional oil required. It is worth it. If you have not gifted yourself a chance to experience this type of massage, do it soon. You can imitate the technique at home for years to come, reaping many benefits. If you’d like to book an Abhyanga massage, contact Urban Sanctuary. A great write up on Abhyanga! Thank you for making it so easy to understand the power of this massage. Thank you. Ayurveda is amazing is amazing.